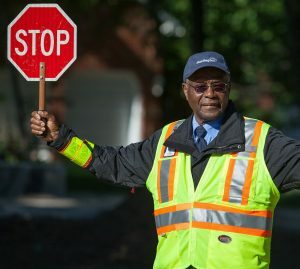 Press Release —The City of Burlington is encouraging residents to recognize their neighbourhood crossing guards during School Crossing Guard Awareness Week, March 19 to 23. School Crossing Guard Week is marked annually in Burlington to celebrate the individuals across the city that assist young residents in making their way to and from school safely each day. As of Jan. 1, 2016, all vehicles and cyclists are required by the Ontario Highway Traffic Act to stop and wait until children and crossing guards have cleared the entire roadway at school crossings. Checking for school crossing guards before turning at all traffic signalsObeying the posted speed limit. Cyril Whaley served as a crossing guard at the intersection of Pinedale and Mullin for 18 years, keeping generations of children and adults safe. Blessed with the smile and good nature regardless of weather or time of day – Cyril was a delight with his parting comment of God bless.